It was a mild sunny day here yesterday so I thought I’d invite you along on my lunchtime walk to go get the mail. That’s right. 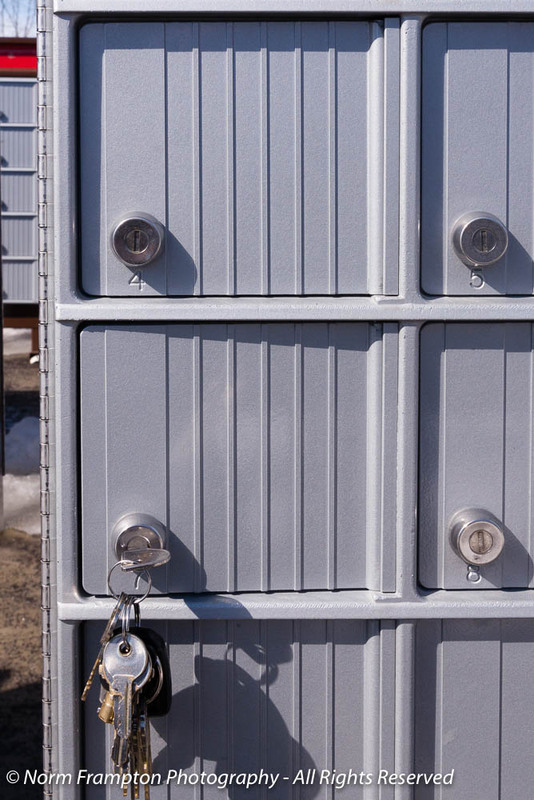 Though Canada Post does deliver parcels to over 16.1 million addresses across the country, today less than 5 million of those still receive daily to-the-door postal delivery, and ours is not one of them. So once or twice a week whenever we think of it, we go down to the end of our street, put our key in this little door and open it to see if we have any new junk mail. How did we go from weekday mail delivery right across Canada, to actually having to pick up our mail at the end of our street? 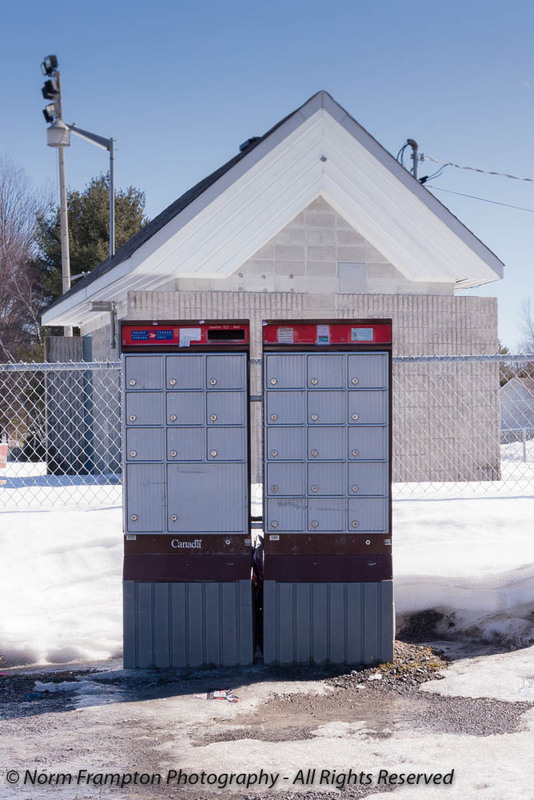 Well, even though Canada Post is a crown corporation, it is required by law to not become a burden on taxpayers and therefore it must be financially self-sufficient. This means they are constantly analyzing their rates and service offerings to make sure they are efficient and profitable. Back in the 1980’s one of the conclusions that came from this self-analysis was that home delivery of letter mail was getting expensive (d’uh!) and the price they’d need to charge in order to make it at least a break-even proposition, was more than customers would accept. Looking at demographics and the acceleration of urban sprawl it was decided that door-to-door mail delivery would be continued in areas where population density warranted it, and would be gradually phased out in the suburbs where it just didn’t make economic sense. 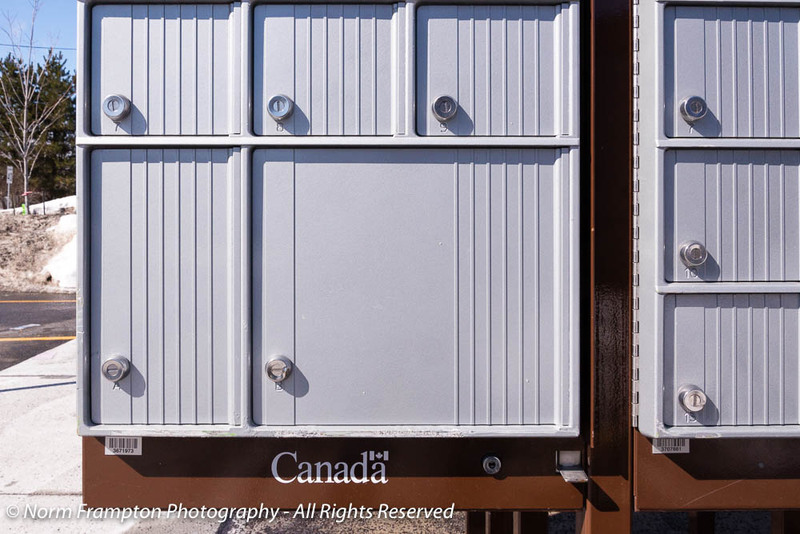 So how would people in suburban areas receive their mail? 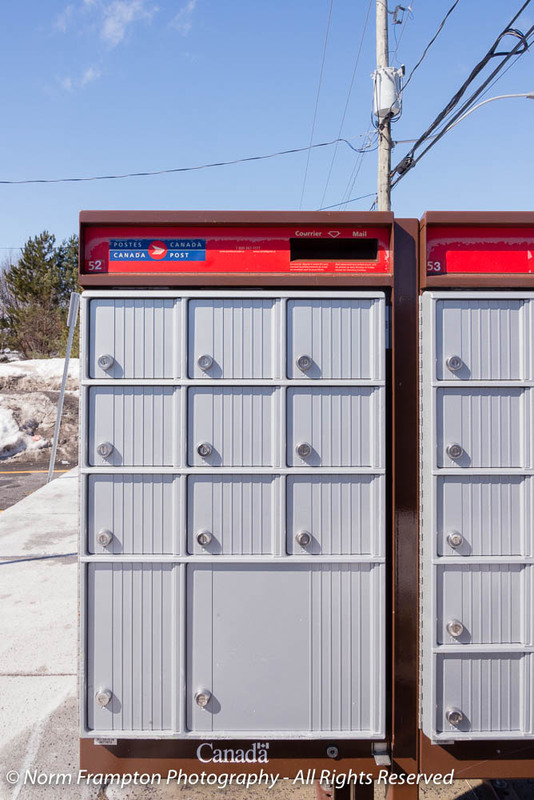 With much fanfare Canada Post introduced so-called ‘Super Boxes’. Needless to say ‘Super Boxes’ and the idea of having to go pick up the mail gave lots of Canadians something to complain about. In the 30 years since, folks in the burbs have learned to accept it, which becomes easier to do since hardly anyone sends letters through the mail anymore anyway. 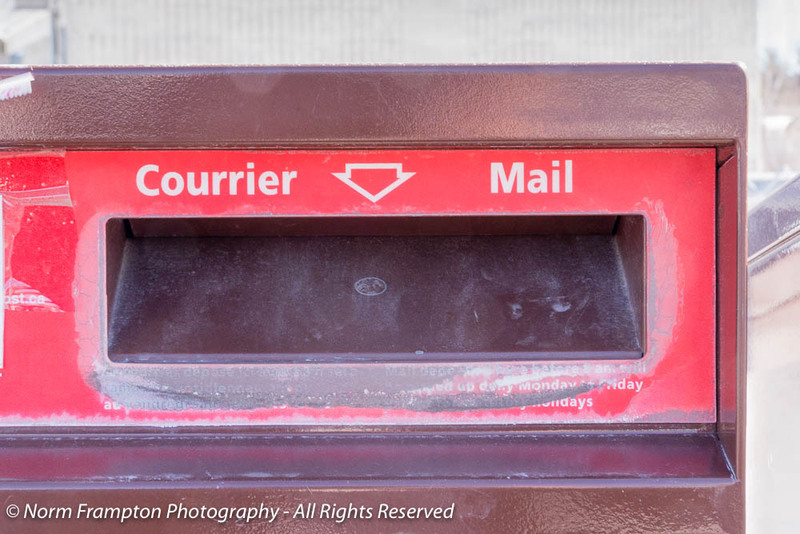 In the meantime, between electronic communications such as email and text messaging, as well as online banking and direct deposits, domestic letter mail keeps dying a slow, painful death. 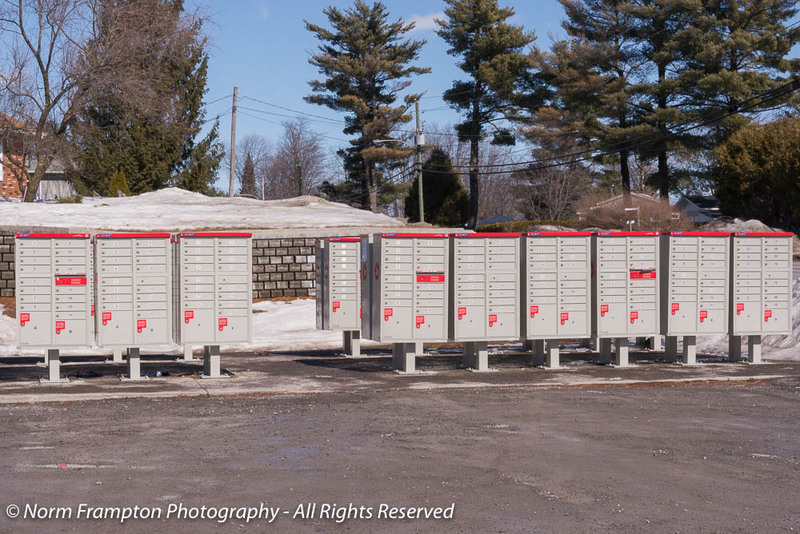 Canada Post has since put more focus on the profitable part of its business, domestic parcel delivery, and thanks to the huge growth in online shopping they are making money at it. But losses incurred by mail delivery eat into those profits forcing them to raise rates and look for ways to make further cuts. In case you’re wondering, it now costs $1.00 to mail a letter within Canada. 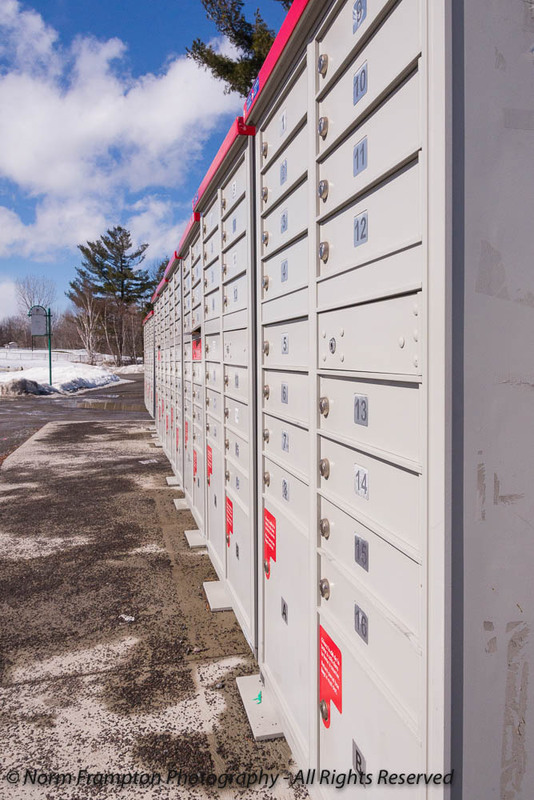 A plan instituted by our previous federal government to abolish door-to-door letter delivery in urban areas in favour of community boxes is now on hold pending further study. In other words, a whole bunch of city folk complained. Other cost-cutting plans that have been floated include reducing the frequency of mail delivery to alternate weekdays, or even just once or twice a week…that’s right, cue the complaining. You gotta feel for Canada Post; they’re not allowed to lose money, but they can’t raise rates or cut service without getting complaints from customers who are using the service less and less to begin with. Yes, it was all junk. 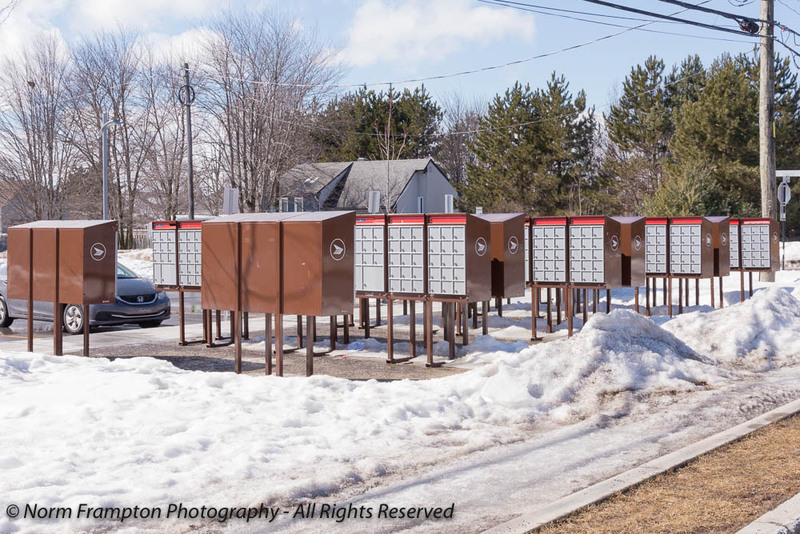 Gallery | This entry was posted in Photography, Thursday Doors and tagged Canada, Canada Post, Community Mailbox, Doors, mail delivery, Mailbox, street scenes, Super Boxes, Thursday Doors. Bookmark the permalink. Having lived most of my life in northern, rural, and just plain old small towns, I’ve seldom had door-to-door delivery. Where I live, now, we walk about half an hour to pick up our mail at a little corner store (to pick up the junk mail and seed catalogues). Based on my experiences, I have a hard time understanding what all the fuss is about. The post office has always been a place of socialization in small towns, we run into the same people on a regular basis, as picking up the mail just becomes a part of our weekly routine. It’s a time to catch up, get the ‘goss’ and have a friendly chat with others in the community. I know there are those with mobility issues, for whom the lack of door-to-door delivery would be a bit more of an issue, but that would be nothing new for those in the communities in which I’ve lived. I suppose some kindly neighbour picks up their mail for them. With fewer and fewer of us relying on snail mail, it just seems to be the way things are going. I’d rather lose this than other, more essential government services. Only one was incorrectly addressed. . . So sorry and have a lovely weekend, Norm. I live in a trailer park and we have little boxes too. I get the mail twice a week. I still get bills, cards, and junk mail. Not easy for them to make profit when wages have to go up to cover inflation while demand for the service keeps dropping. Canada often seems far more progressive and wise than the United States. I wish more of our government agencies were required to be fiscally sound. Thanks Phil. It kind of shows that there are responsible ways to do socialism. I just wish we did more of it, but this one was certainly good foresight on the part of the government when the postal act was updated in the early 80’s. Switching from dollar bills to coins and abolishing the penny were some of the other “controversial” cost saving decisions that people have gotten used to here. If only Canada was warmer, I would be happy to move there. As it is, I don’t live too far from there anyway. And I’m actually going to visit there twice in the next two months. Oh, my… I have definitely become an “Angelena,” haven’t I? Whenever the temps get down to 50s everybody starts complaining. I really don’t care for it…and as you point out we receive so little “real” mail these days its hardly worth the walk to the box! The lack of demand for mail service will ultimately be its demise, in my opinion. What will be interesting to see is how much longer we keep hanging onto a system that hardly anyone needs or uses. I must agree that these mailboxes are not visually appealing. Even the color is boring. I guess I’ll quit complaining about the cost to send a letter in the US and be grateful I don’t have to trek to the end of the road to get my mail, such that it is. Love your unconventional door post. I think I would be one of the complainers too. I like my mail delivered to my home where it’s safe inside my house (the slot goes into our garage). That way, if we leave for several days, we don’t need to worry about the box getting full… yes, yes, I know… it would be full of mostly junk mail… but it’s our junk mail. Great door post, Norm! I guess this gives us permission from the Grand Doormaster to expand the definition of “door.” Just like Donna said in her comment, the selection of doors in my area is pretty sad. Very interesting! It may be more inconvenient but at least your postal service isn’t heavily in debt like ours in the USA. Thanks Judy. I like to think it shows that there is a smart way to do socialism. I just wish we did more of it though, because whenever public funds are involved…well some folks act like there is a limitless supply. Canada Post has done exactly what you mentioned; cutting the workforce not through layoffs but by not replacing people when they retire. Seems post office complaints are universal! I never dreamed I’d be on the same wavelength today as Norm 2.0!! Whodathunk??!! Interesting to see how your system works 🙂 We still have mail daily to our door and know our postal person well enough to wave at the store. I’m kind of bummed out for you guys. The Canadian Crown is still very nice to its inhabitants! In Holland (country of origin) they have solved it by releasing the Post to the private sector. So now organizations compete for prices. Me thinks the Canadians can beat the Americans in complaining (at least about political happenings). And most of the complaints are so lame or not thought through, its not something to write home about. We Americans have a lot more to complain about (at least about political happenings and health care woes)! This reminded me of how the mail is handled in an apartment complex and some subdivisions. It was interesting to read why Canada chose to do that. Count yourself lucky I guess. Curbside or to-the-door delivery is fading away fast in many places. Ugh. I am all for self-sufficient, and would gladly pay a dollar to mail a domestic letter, (I pay much more to mail to Canada!) I have been informed junk mail is the only thing keeping the USPS afloat. So, much as I hate junk mail, I ultimately support it for supporting the USPS. I have twice lived in neighborhoods where the boxes are like this and I am not a fan. Furthermore, I did not enjoy the gentle nagging of my mother to go down and check my mail every single day. It was something I considered when we bought this house. There is always the possibility we will move to box hubs, but for now, I’m grateful. Yeah, I think it’s about $1.50 to mail to the U.S. from here, and overseas is almost $3.00. I have to say that it did factor into our decision to stop mailing Christmas cards last year. I don’t mind the junk mail too much, especially since it and parcel delivery are the only things keeping the post office going. I think when more businesses stop mailing statements and checks, that’s going to be the end of it for the post office, at least in the way we know the post office now. Cummunity mail box…mmm. well, it’s better than having to go all the way to the post office to pick up the junk mail I always get. Interesting post. I like your approach for this weeks door-challenge. So different, so small, yet so useful. I wonder if we will still have mailboxes outside our homes in 20 or 30 years? Thanks I thought it would make for an interesting twist. We’ll see how things play out, but I do get the feeling that most places won’t have mailboxes in 20 or 30 years – they just won’t need them. I absolutely love this twist on ‘Canadian doors’, Norm! I am often frustrated by the lack of ‘interesting doors’ in our town. This post has inspired me to look beyond the obvious! Yes I am running low on doors. I thought this was a clever idea, but truth is if a don’t get into the city for a few doorscursions soon I’m going to have to get very creative. I find the idea of community mailboxes interesting. Some days we have a hard enough time remembering to step outside our front door and taking out the mail, so I shudder to think how much would pile up in a mailbox that we needed to leave our front step to collect! You’re right Jean, it is still relatively inexpensive here. We’ve been somewhat spoiled I guess, but there’s no doubt that price increases and more changes are on the way as the drop in the volume of letter mail continues. Self-supported? The Post Office?? Ha! If we had that in the US, there wouldn’t be mail service. 🙂 Although in Cleveland, our mailman/women walked and put the mail in the box either by the house or the slot in the house, depending on the age of the house, here we have a mailbox by the street and the carrier drives by and puts the mail in. My parents in Arizona have an arrangement similar to yours, but they live in a gated community. I still try to send real mail every so often, but not to many people do, which is probably part of the problem. Thanks Janet. We pay all our bills and do our banking online, don’t receive printed statement anymore (all via email) and I honestly can’t remember the last time I sent someone a letter so I guess we’re part of the problem. In fact, when they raised the rates to a buck a letter last year, that’s when we decided to stop sending Christmas cards too…though I still feel bad about that one. $1 is pretty steep. I like to send post cards when I’m on vacation and by the time I buy the card and the postage, it gets to be closer to $1 than I’d like. I’m disappointed in Canada: Seems like they could have made those community boxes a little cuter or cooler. Paint them like apartments. Put some of those kids’ glittery windmills on top of them. Faces on the doors or SUMPIN! Can you paint your own box, or would that be defacing government property? Oh, well, thanks for the lesson about Canadian post. I love it when I start the day by learning something! OK, Canadian artists! Get out your paints and brushes! 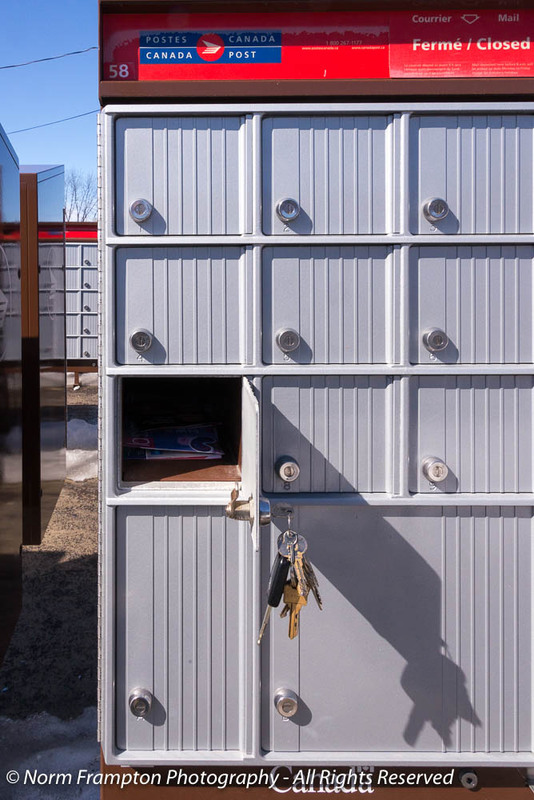 Make those efficient community mailboxes into works of art! You figured it out Marian. Painting/decorating is a big no-can-do. I came from a small community where mail pick up only happened at the post office. At ‘rush hour’ during lunch time and after 5 pm, it often turned into a social time. It was a rare day that my dad didn’t come back from the post office without some local gossip he had picked up while he was there. Since I left my hometown, I’ve had at-home delivery, but like you said, it’s dwindled down to almost nothing except junk mail. Do you know who is responsible for ensuring the area is kept clean and clear of snow? Our boxes are on the edge of a school parking lot, so I assume that whoever has the snow clearing contract with the school is responsible for the mailboxes too. I can can that they’re doing a good job. We’ve never had problem accessing our box, even after some pretty heavy snowfall. As someone who worked his way through college by delivering mail and whose father retired from the US Post Office, I find the inevitable end of the daily mail era to be sad. We still have daily delivery to the mailbox by our front door. We know our mailman and we only complain when one of his substitutes (subs) brings the mail wet or damaged. I still think the answer is for the official post offices to offer an official, inexpensive paid email. If people had to pay, even $0.001 to send an email, I’d get a lot less junk. I’d happily throw the switch that says “I don’t accept free email” and be done with spam. The only good thing is that, as are far as I know, they have yet to lay off any employees. They’ve been cutting staff solely through attrition – not replacing those who retire. I’m not sure what the permanent solution is, or even if one exists considering the challenges they face, but it would be a shame to lose the post office completely. 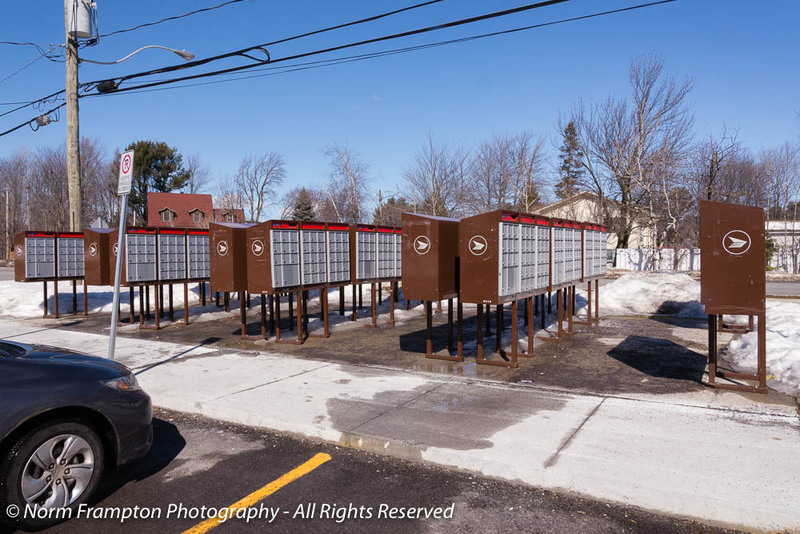 That is an interesting concept – it’s got me wondering if something like that could be implemented here in Australia… But how did they make space for all these Community Mailboxes? I think people here would also complain that they’re an eyesore and a waste of space. There is something pleasing in how neat and orderly they look though.